We’ve already written a few posts looking at BMI and climbing across a few different data sets, and now comes the final chapter! We’ve combined every single ascent logged on 8a.nu with every profile to see if there’s a correlation between BMI and hardest grade climbed in the last 2 years. After filtering off climbers without a height or weight, we’re left with a grand total of 1,089 female climbers and 8,856 male climbers. And the conclusion…is the same as in previous posts! 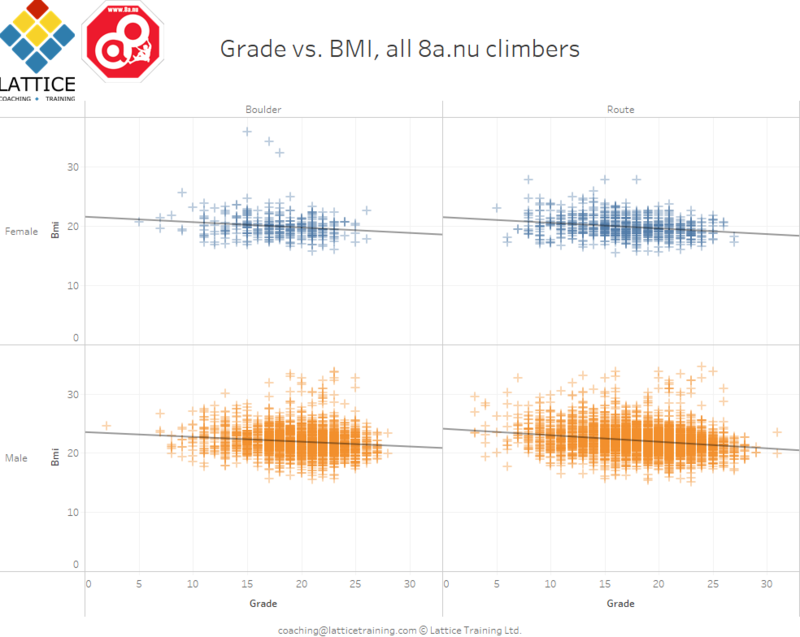 From the data we have available at the moment there doesn’t seem to be a correlation between best grade climbed and BMI. Of course this doesn’t rule out the idea that short term weight, carefully controlled loss can be beneficial in the right circumstances, but it does suggest that long term, maintaining a low BMI is not correlated with achieving higher grades. In particular we note that the vast majority of climbers in the 8a.nu sample are in the ‘healthy’ 18.5 – 24.9 BMI range (1) regardless of max grade. Note: The grade axis in the above graphs are a linear map from french sport grades and font boulder grades. Number of people with BMI over 30 !!?? Agree with above comment by Iain, presenting both significance testing of the regression model and r-squared values as well as residuals is needed to be able to draw any valuable conclusions. Drawing conclusions based on the data presented above, without further statistical analysis is risky.